Roppongi is a district located in the Minato Ward of the Tokyo metropolis. Roppongi is known for its nightlife (bars, restaurants, and dance clubs). It's also become a shopping destination for travelers and locals alike. Thanks to its bustling leisure options, the district has become one of the most(if not the most) diverse, in terms of nationalities, in all of Tokyo. Roppongi also enjoys a location in the heart of the city. It is bordered by the Akasaka and Minamiaoyama districts to the north; Nishiazabu district to the west; Motoazabu and Azabujuban districts to the south; and Azabunagasakacho, Azabudai, and Toranomon districts to the east. Roppongi's role as the center of entertainment and nightlife is no accident. The district has earned its reputation over centuries of development, destruction, and redevelopment. Today, it is hands-down the most diversified district in Tokyo and by extension all of Japan. Tourist businesses cater to the global crowd and attract Japanese crowds as well. There is a healthy art scene featuring museums, galleries, and installations. Also major Japanese and global corporations have set up shop within the numerous towers in the area. Roppongi's history traces back to the 1600's when it was home to Edo's feudal lords. The name Roppongi (六本木-Six Trees) reputedly derives from the fact that in the Edo era six local landowners all had the character for tree (木) in their surnames. In the late 1800's, Roppongi became home to soldiers of the Japanese Imperial Army. Thanks to its new and young population, it started to become a center for nightlife, however, the area was totally destroyed in World War II. After the war, it became the residence quarters for the American Army and government officials of the Allied forces due to its proximity to the Emperor's palace. Japanese-owned restaurants, brothels, and bars began to pop up in the area catering to the westerners. Not too long after, Japan's locals began to visit as well. As the district grew in popularity, so did its music scene. Popular nightclubs began spinning disco and attracting masses. However, many shut down during an economic recession period in the late 80’s. 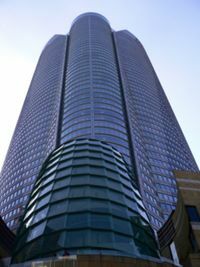 One of the most important events in Roppongi’s history occurred at the turn of the millennium when the 27-acre ‘’’Roppongi Hills’’’ complex was completed. It cost almost $5 billion dollars and includes major attractions like an amphitheater, a hotel, a museum, and a famous TV studio. The Hills complex also includes smaller attractions such as offices, apartments, movie theaters, shops, and dining options. Public transportation map for the district. Roppongi's proximity to Haneda International Airport and the center of the city mean that it's well-connected. Easy to get in to and out of. From Haneda Airport the simplest way to Roppongi is to catch the monorail from the airport to Hamamatsu-cho Station, then follow the signs to Daimon Station on the Oedo Line (about 2 minutes walk). Roppongi Station is three stations from Daimon Station. From Narita Airport either catch the Airport Limousine Bus which has stops at several hotels in the Roppongi area (you don't need to be a guest at the hotel) and costs Yen 3,100 or catch a train, the easiest of which is the Skyliner from Narita Airport Station to Keisei-Ueno Station, change from Keisei-Ueno Station to Ueno Station (about 10 minutes walk) then catch the Hibiya Line to Roppongi Station. This costs Yen 2,670. Chiyoda Line - Runs along the north-western border of Roppongi. Its Nogizaka Station is located at the boundary between the Roppongi and Minamiaoyama districts. Hibiya Line - Runs east and west through Roppongi at the district's horizontal center. It shares the Roppongi Station with the Oedo Line; again, this station is closest to the Roppongi Hills complex and lies along the Metropolitan Expressway Shibuya Route Junction( a major artery in Tokyo's transit system). This Line is usefull for getting to Ginza, Tsukiji, Akihabara and Ueno. Namboku Line - Runs along the eastern border and then goes into the north-eastern corner. Its Roppongi Itchome Station is located near the Metropolitan Expressway Shibuya Route Junction which is a major artery in Tokyo's transit system. Oedo Line - Runs north and south through Roppongi at the district's vertical center. 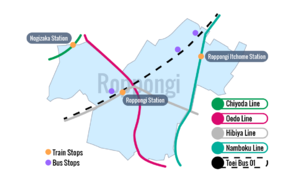 It shares the Roppongi Station with the Hibiya Line; this station is closest to the Roppongi Hills complex and lies along the Metropolitan Expressway Shibuya Route Junction which is a major artery in Tokyo's transit system. Note that the Oedo line is very deep underground (42 metres). You should plan on at least 10 minutes to get from the platform to the exit. This line is useful for getting to Ryogoku (Sumo Hall) and Shinjuku (note: Shinjuku Station is large and confusing with more than 200 exits so please plan ahead). The Toei Bus Line 01 runs underneath the Metropolitan Expressway. It travels east-west between Shimbashi Station (destination: 新橋駅前　－ Shimbashi Sta.）and Shibuya Station (渋谷駅前 - Shibuya Sta.). Adult tickets cost 210 yen and child tickets 110 yen per ride. Enter the bus by the front door and put coins in the coin box, a 1,000 yen note (larger notes are not accepted) in the note slot, or wave a Pasmo/Suica card over the reader. Change comes out automatically. There is free Wi-Fi on the buses (Toei_Bus_Free_Wi-Fi). outside Roppongi Station: westbound is near the Azabu Police Station; eastbound is outside the Mizuho Bank. a little west of Roppongi Hills: westbound is near a 7/11 convenience store; eastbound is outside Ex Theatre Roppongi. further west near Gaien-nishi Dori: westbound is outside Sunkis convenience store; eastbound is near a restaurant called Iriguchi, opposite a carpark which is under the elevated freeway. a little east of Roppongi Station: westbound is outside a 7/11 convenience store; eastbound is outside a pay carpark, near Apis furniture store. further east near Roppongi Itchome Station (Namboku line): westbound is outside a pay carpark, near the Tamachi freeway junction; eastbound is outside the APA Hotel. The district is close to Tokyo's touristic center so it's not totally impossible to walk to Roppongi from surrounding districts and wards. Get in touch with the Tokyo Pub Crawl and tag along on Japan's version of a bar tour. Don't be surprised to see a mixture of enthusiastic Japanese students, young professionals, expats and the like. Drinks are discounted, and the 11:30pm ending time leaves room to catch the last train home or (for the determined) further explore the clubbing scene. In the first several floors of Mori Tower and the adjoining buildings, there are heaps of shopping spots, nearly all are upscale. Similarly, most of the restaurants have a lot of style, and with prices to match. Azabu-Juban is a quieter commercial district to the southeast of Roppongi Hills, and a good place to spend a lazier afternoon browsing through shops and enjoying the local cafés. The surrounding residential area is popular among professional expats, so expect to see many international families as you walk through. Not surprisingly, Roppongi has lots of international restaurants. Seijo Ishii, located in the underground walkway between Roppngi Station and Roppongi Hills is open 10am till 11pm and is quite reasonable. Some of the best cheap places to eat in high-rent Roppongi are the numerous fast-food joints', most of which keep late hours to cater to the party crowd. Cinnabon has recently established their first Japanese outlet in Roppongi. For less than 500 yen, you can get a cinnamon bun. Numerous fast-food chains are available, including Subway, McDonald's, and SoupStock. Turkish doner kebab vans on the street at night are really popular for people getting out of clubs. Watch out though, as hygiene in these places is appalling. The guys who run these places go the bathroom, then go right back to working without washing their hands. They don't even care if customers see them doing this. Roppongi is the place to be at night if you don't mind the periodic hassle of touts urging you to "just take a free look" in their bars and clubs. Nightlife often starts later than in other parts of Tokyo and many bars, clubs and discos are open until 4AM-5AM when the first trains run in the morning. Most other nightlife in Tokyo shuts down when the last trains run (around midnight). If you start your evening early you might consider starting in Shibuya and move over to Roppongi after 11PM. There are innumerable watering holes and generally speaking, first floor and ground floor establishments cater to non-Japanese while higher stories feature more exclusive clubs aimed at, but not exclusive to, Japanese clientele. Don't be surprised if you wander into an organized event as Roppongi has a reputation as a major party center. 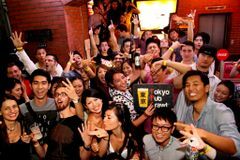 Internationally-oriented parties, such as the Tokyo Pub Crawl, are fairly common and undeniably welcoming to travelers, local Japanese, and expats alike. An ID is required at just about all of the major clubs, so bring along your passport. Note that leaving and re-entering a club (without being charged a second time) is often not possible. While Roppongi is dotted with a number of high-end larger clubs, there are also plenty of smaller, often cheaper and edgier dance halls worth exploring. As a rule of thumb, exercise caution towards establishments solicited by street promoters, as some will go so far as to spike your drinks and wring you dry. If promises of free women and cheap drinks seem too good to be true, they usually are. Avoid going to a bar you never heard of with someone that you did not know before your journey. Girls that 'like' you usually try to make you buy expensive drinks at clubs and will not engage in any sexual activities. Leave the credit card at home (in a bid to combat fraud an increasing number of bars accept only cash anyway). Sleeping is probably the last thing on your mind when here. There are plenty of places to hang out between the last train and the first one in the morning, but not surprisingly very few of them are free or inexpensive. Note that if you are a foreigner, then all hotels will require your actual passport in order to make a photocopy. These are all legitimate hotels, not love hotels. So if you find yourself needing a love hotel, your best bet is to take a cab to Shibuya. Roppongi has traditionally held, by Japanese standards, a slightly dangerous reputation despite the fact that crime rates are well below city averages. Recent efforts to increase police patrols, curb petty crime, and crack down on off-license clubs have largely alleviated the areas' undesirable reputation, but isolated incidents do exist. Street scuffles should be steered clear of as standard operating procedure for the police is to grab everybody in the vicinity and lock them up until things are sorted out, which may take time. Some petty theft also occurs in crowded bars and clubs. Be wary of hustlers on the streets, specifically the Nigerian hustlers, who will often try to talk foreigners into going to hideously overpriced bars or clubs--the extent of the overpricing may not even be apparent until you get the bill at 5:00AM. They can be quite aggressive, especially if they think you might be in the military, but they will leave you alone if you keep walking and ignore them. Unless you know where you're going, stick to places on the lower level of buildings, preferably with a sizable crowd, and don't bring your credit card, as most of the legitimate places don't accept them anyway. Never go to a place suggested by someone you just met. Be careful when a random, lonely girl starts talking to you or seems overly eager for company. Some shady club owners send good-looking girls to nearby clubs and bars (typically to those with no cover charge) and after having an intermezzo there, they will try to persuade you to go to a different club, where they will order a very overpriced bottle of wine - which you'll have to pay. Arguing with the bouncers surely won't help when you try to leave. In the past, such women have been known to spike your drink and run up your credit card, although this is happening less often nowadays. Nonetheless, keep your eye on your drink, keep your credit card in your wallet, and don't be fooled by advancements which seem too good to be true. Be especially careful when someone is saying they are there just for holidays just like you but keeps following you, asks you which club you want to go to and if you have a credit card or jokingly asks if you're working for the police. These are obviously immediate red flags. "'Tomodachi Lounge'" has been reported as a known offender. Do not exchange money at a random bar - they will usually try to rip you off. While Roppongi still struggles to restore its reputation, it is far less dangerous than the other major areas that cater to foreigners in Asia. It's not even the most dangerous place in Tokyo in terms of clubs hustling customers: that distinction goes to Kabukicho and its Yakuza-owned hostess bars. Some of the best clubs/bars require elevators to get into them. Remember that, it is slightly dangerous by Japanese standards, but Japanese crime standards are very different than those in much of the world. Roppongi is very safe, as long as you are not there during an earthquake. Many young women walk on the street alone late at night in complete comfort, and a policeman is never far away. The main danger is to your wallet. Complete a night of decadent debauchery with a sushi breakfast at Tsukiji, a few stops down the O-Edo Line. This page was last edited on 12 January 2018, at 01:29.